From Anita Goodesign: Anita's Sampler has been such a huge hit at our Fall Embroidery Parties that we have decided to release this collection as a Premium Plus Edition—we have more than doubled the size of this collection with over 50 new pieces of sewing themed artwork! Anita's Sampler teaches a dozen different techniques that can be used to create cozy quilts, handy zippered bags, lovely free-standing lace ornaments, and more. This collection will teach you step-by-step techniques like raw edge applique, confetti applique, trapunto and shadow work, folded fabric piecing, and peek-a-boo cutwork, to name a few. Learn how to choose the correct stabilizer and get an inside look at how the Anita Goodesign team chooses colors for our designs. You'll receive all of these designs on a DVD-Rom with video tutorials, plus a full-color tutorial book to guide you through each project. And, of course, this collection is fully compatible with all of our Mix & Match Quilting Collections. The quilting techniques in this Premium Plus collection cover everything from folded fabric to raw edge appliqué. Each of the quilting blocks comes in multiple sizes as well, so every quilt design in this collection is fully compatible with our Mix and Match Quilting line. Each of the designs comes in 5 sizes. The new AA size is also included, which is for a 9.5” x 14” hoop. The smallest size will fit in a 5”x7” hoop. 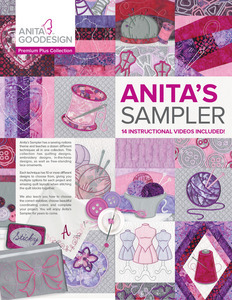 Anita's Sampler Premium Plus Collection Promo. This beautiful sewing themed collection is now available. Watch to learn more about this Premium Plus! Back of Package. You’ll receive all of these designs on a DVD-Rom with video tutorials, plus a full-color tutorial book to guide you through each project. 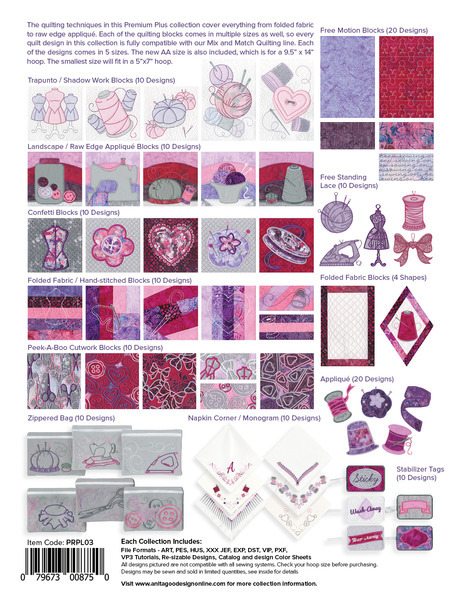 And, of course, this collection is fully compatible with all of our Mix & Match Quilting Collections.